Squarely blaming the US for disrupting the world order by seeking to impose its will on other nations, Russian President Vladimir Putin on Friday warned that new wars will break out if Washington doesn’t learn to respect the interests of other countries. 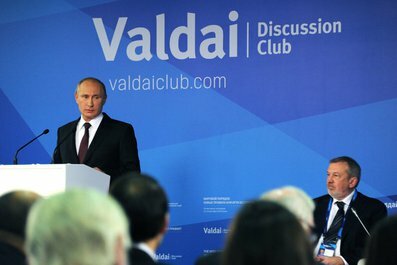 Putin was speaking on “The World Order: New Rules or a Game without Rules” to a group of political scholars at a meeting of the Valdai International Discussion Club in Sochi, Russia. The Russian Prez pointed out that the wars in Iraq, Libya and Syria are due to the botched policies of the US. He asked if the US policies in those countries have made the world a better place or a dangerous one. “A unilateral diktat and imposing one’s own models produces the opposite result. Instead of settling conflicts it leads to their escalation, instead of sovereign and stable states we see the growing spread of chaos, and instead of democracy there is support for a very dubious public ranging from open neo-fascists to Islamic radicals,” Putin said. He said by meddling in global affairs, the US is making “the same mistake over and over”. Putin also lashed out at the US for trying to isolate Russia over the Ukrainian crisis. He said the US’ efforts to cast Russia as a danger to the rest of the world by forcing the former’s allies to impose sanctions on Moscow would not succeed. As a result of the sanctions, Russian banks and state companies have been cut off from foreign capital markets, forcing investors to flee the Russian market.